The regalia used by friendly societies became highly organised as time passed. It was very stylistic by the late 19th century when almost every society conformed to the same basic patterns. At its simplest this might comprise an insignia or flag, a uniform dress code for public occasions, perhaps with a flower or sprig of greenery in the lapel, and a badge of office for the master or president of a lodge. At its most complex there might be an array of aprons, sashes, neck ribbons and badges all complemented with medals or 'jewels' for service. Each kind of article could be further divided into pieces of different colours for different lodges, different degrees, the district or the Grand Lodge, and the rank of the wearer. The officers of the society wore identifying letters and devices; others had sticks, staffs and sometimes weapons to carry. 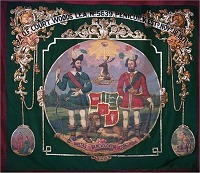 One or more giant marching banners were added to the older insignia or flags, preferably one from the firm of Tutill in London. The parallels to freemasonry were deliberate. In fact, by the end of the 19th century, it was the Masonic warehouses, such as Jockels of George Street in Edinburgh, that dominated the supply of all these articles. These firms probably had the greatest input into their design. Earlier pieces tended to be homemade, or purchased from a local tailor or seamstress. Later, the design became more uniform and the similarity to Masonic regalia was more pronounced - to the danger of complete confusion. 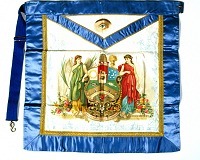 Amongst benevolent associations the least common pieces were aprons. However, all appear to have had them available, particularly the free gardeners. Sashes were the most common articles. These could be the heavy plaids worn by the Loyal Order of Ancient Shepherds or the little green ribbons worn by child members of the Ancient Order of Foresters. Within any order there was a wide variety of sashes. Colours and stripes were used to indicate different lodges or officers. At least one set of black and white Forester sashes survives in a museum collection; these may have been only used at funerals. Neck ribbons were mostly used to designate officers. Sometimes they had metal, often gilt or sterling silver, insignia for the same purpose. All three common articles - aprons, sashes and ribbons - could be decorated by adding embroidery, printed silk panels, and sequinned or braided decorations as well as gilt letters to identify degrees or officers. The Royal Antediluvian Order of Buffaloes wore decorative cuffs, as did some other organisations. Rings, hats, belt buckles and lapel badges are found less commonly; these tended to be personal pieces that were worn to indicate affiliation. Most societies that survived discarded their regalia in the second half of the 20th century. Often, only the most precious officers' insignia continued to be used. Musselburgh Fisherman's Association continued their traditions to the end of the century, when the Venerable Master still wore his sash.